NEW YORK (CNNMoney) -- The head of General Electric told a jobs summit at the U.S. Chamber of Commerce Monday that businesses needed to take the lead on job creation. At a conference where many of the comments were focused on government barriers to hiring, GE (GE, Fortune 500) Chairman and CEO Jeffrey Immelt acknowledged there needed to be some policy changes by Congress and the Obama administration. But he said that the responsibility for hiring lay with businesses. "The people who are part of the business sector, the people in this room, have got to stop complaining about government and get some action underway," he told the group. "There's no excuse today for lack of leadership. The truth is we all need to be part of the solution." 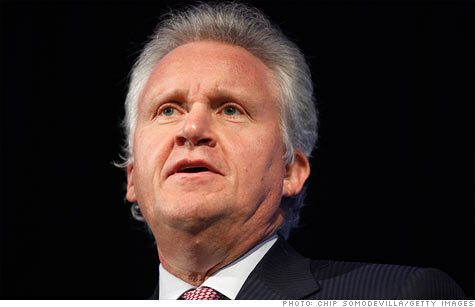 Immelt is the chair of President Obama's Council on Jobs and Competitiveness. He said the group has made a number of recommendations for changes in government policies that should be able to help job creation, such as the executive order announced Monday asking independent agencies to rid their books of old and outdated regulations. Immelt said he is committed to working with Obama on other moves that can help hiring, and that he expects to have proposals by the end of the year that should help to create up to 1 million jobs. But he said that it's important that businesses take action -- like taking some risks, and thinking about bringing back jobs that had been moved overseas. If companies examine the changing economics of some of those jobs, Immelt said they would find it is beneficial to bring jobs back home, which he said GE has done with some jobs now being moved back to Kentucky and Michigan. And he said that arguing between business groups and the government isn't in the best interest of the nation's economy. "We can't always be fighting. We need to act, and the private sector can do more," he said. The Chamber's jobs summit came in the wake of a disappointing government jobs report that showed hiring ground to a near halt in June. Immelt and other speakers referred to the report as a sign of the serious problems facing the labor market. "We have a lot of work to do," he said. Earlier in the day, Chamber President and CEO Thomas Donohue laid out his group's broad plans to improve hiring, with most of the focus on changes in government policies. Among the changes he called for were the passage of pending free trade agreements, reform of visa rules to allow companies to hire skilled workers and recent graduates from overseas and to boost spending by foreign visitors. He also called for easier permitting of new projects and reform of government regulations. "Can you blame these businesses? They don't know what's going to hit them next, and that's what worries them the most," said Donohue. Donohue and Immelt both said it is important that Congress quickly agrees to raise the debt ceiling to remove that uncertainty. Donohue said this should be done in conjunction with a long term plan to cut the deficit, primarily though spending cuts. The Chamber chief also advocated more infrastructure spending on things such as road projects, and he said a higher gas tax is needed to fund those projects. The Chamber also released a poll of small businesses that showed only 19% of businesses plan to add jobs in the next year, little changed from the 18% that increased their payrolls in the last year. Nearly 40% of those surveyed cited either worries about what the government will do next, the requirements of the new healthcare bill or too much regulation as the number one obstacle to hiring. But economic uncertainty by itself was the biggest obstacle for 30% of those surveyed, while lack of sales was the biggest problem for 22%.